"Conquer the skies and all below you will fall." Profile: Divebomb is like a kid at a candy shop - as he flies high overhead looking down at the ground below, he's so delighted with all the targets he has to choose from that he doesn't know where to begin. But it usually doesn't take long before he's gleefully shooting up the countryside. He's almost always in good spirits. The only thing that consistently ruffles his carbon-steel feathers is when he must surrender his own independence to combine with his fellow Predacons. He doesn't care for his fellow Predacons and detests sharing his components with them. When not engaged in combat, Divebomb usually busies himself in the building of his latest mechanest. Perched atop tall buildings or mountain peaks, these fanciful, fortified constructions are commonly composed of late model sports cars, wings of low flying jets and theater marquees. "I like to live comfortably," says Divebomb. Abilities: Rocket thrusters mounted on his back allow Divebomb to achieve speeds of 300 mph when in eagle mode. He has a 2000 mile range and can reach an altitude of 18 miles. High resolution telescopic lenses within his optical modules enable him to spot a dime from 10,000 feet. He can lift a tank and tear through its armored skin with his beak. In robot mode he uses a particle beam rifle with infrared sight and a laser-guided sword, which is guided to its target after Divebomb first pinpoints the target with a laser beam that shoots from the sword's tip. 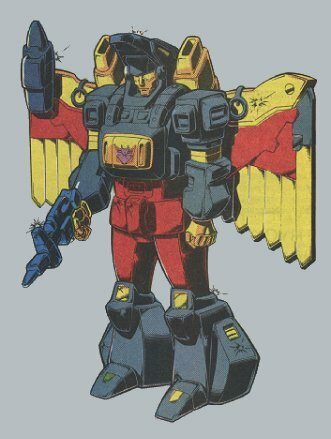 Divebomb combines with his fellow Predacons to form the giant robot, Predaking. Weaknesses: Divebomb's internal guidance system is easily thrown off by magnetism. Such interference causes him to lose control while he's flying and makes him prone to crashing.